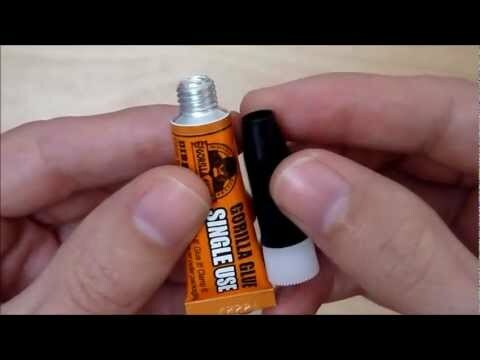 Gorilla Glue recently came out with a new single use tube packaging for their original polyurethane Gorilla Glue formula. The idea is that a person that rarely needs the glue can open up a fresh tube for each project; or stash away a tube in a tool box, glove box, tackle box, etc box when a repair calls. We already know the Gorilla Glue polyurethane formula works, but will the new tubes keep the glue fresh? When we opened up the packaging for the new Gorilla Glue single use tubes we saw a problem right away. When you attach the caps to the tubes the foil that seals the tubes gets punctured by the cap. So if you leave the cap off, the glue should stay fresh for a long time, but leaving off the cap gives you two pieces to keep track of. So I wanted to find out if the glue would stay fresh if the foil was punctured by the cap. To test this I put the cap on a tube of glue to break the seal and threw it in a bottle of water. Because Gorilla Glue cures with the addition of water, I knew this would be a good test. There it sat for a few weeks and every once in awhile I gave the bottle a good shake. It turns out that the cap does a really good job of keeping water out and thus saved the glue from a water grave. This was a pass or fail test and it looks like the Gorilla Glue Single Use Tubes passed. The next time you are in the store, you might want to pick up a pack, I imagine they wll be handy to have around.